Let me start off by saying, we didn't find the horse. But that's ok, Once you start getting close to the Lost Horse Mine, there's so much stuff to find that you completely forget about about the horse. And in any case, it's probably roaming that endless range up in the sky now anyways. But why are we talking about this horse, anyway? Well, back in the early 1890s (as one legend goes), Johnny Lang arrived in the area along with his father and brother. They'd brought cattle with them from Texas, and were looking for grazing land for their herd. They happened to meet a prospector by the name of "Dutch" Diebold who had an interesting story. 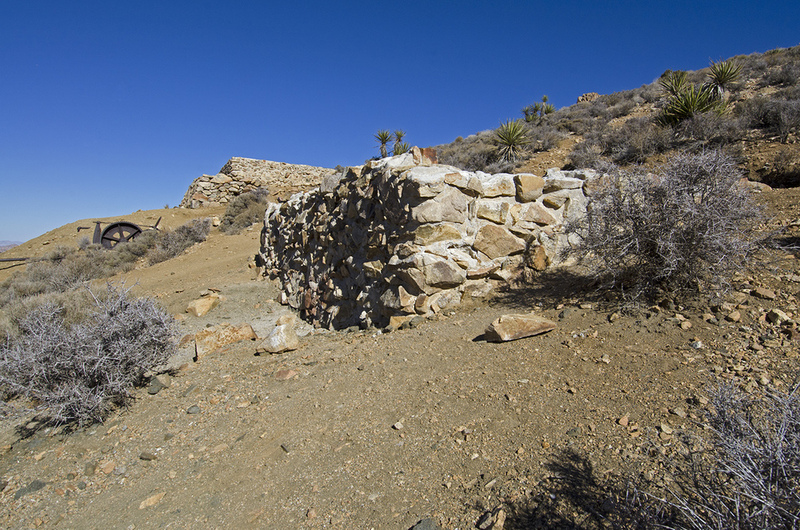 Dutch had discovered a gold-bearing quartz vein near Pinyon Mountain, but had been run off by the ne'er-do-well McHaney clan. Apparently, Johnny Lang had also had an encounter with the McHaneys while looking for a lost horse. 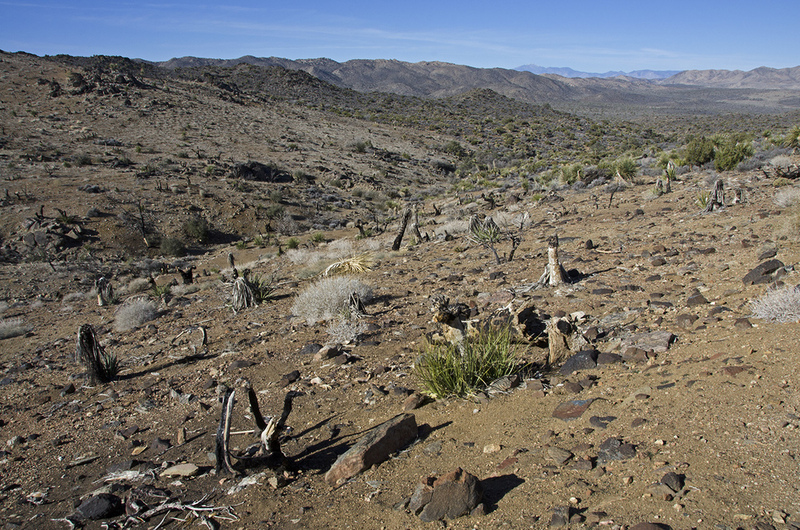 After walking into their camp, he explained he had been trailing his lost horse. Jim McHaney may or may not have told Johnny that there weren't any lost horses in the area, even though Johnny could see his horse in the camp. The fact that McHaney was holding a gun probably influenced Johnny to agree that there weren't any lost horses for miles around. As it eventually turned out, Johnny had the last laugh, as he, his father and two other partners ended up owning the claim that Dutch had originally located. 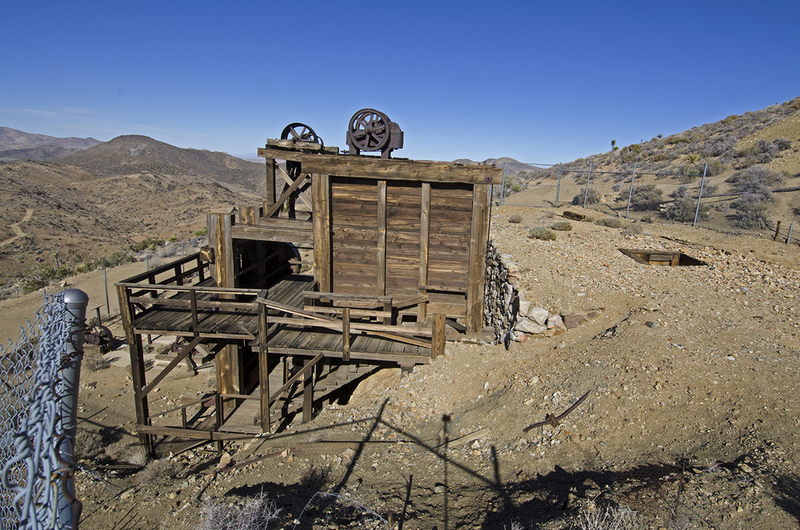 The Lost Horse Mine became the most profitable gold mine in the area and was worked extensively for a number of years. The entire story of the mine, it's discovery, workings and the miners who operated it is fascinating. 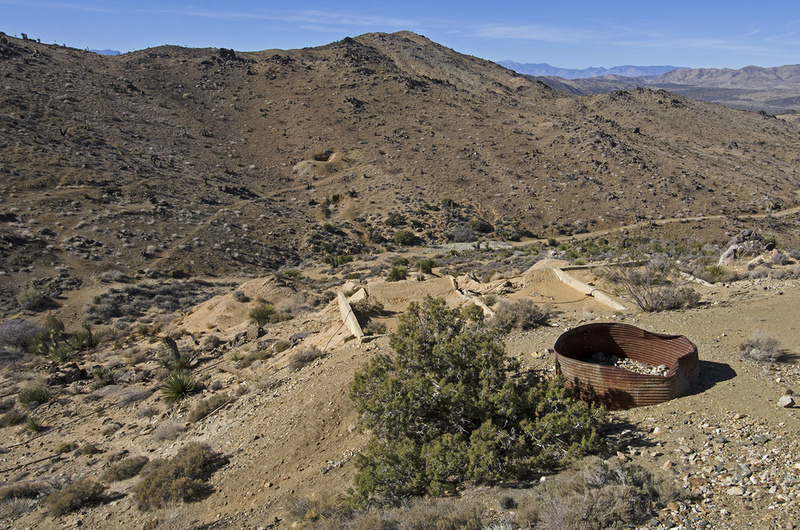 For a little more history of the mine, click HERE to visit the JTNP website. Knowing we would probably turn a four-mile-round-trip into something much longer, Murbachi and I set out early on the trail of the Lost Horse. If we just hiked there and back, the trip would be roughly four miles of moderate hiking. Food, water, survival gear, cameras and hope, we set off. And as things turned out, we ended up hiking about 7 miles. And no, not because we got lost. There's lots of history to find along this trail. The total elevation gain from the trailhead to the Lost Horse Mine is a bit over 500 feet, or maybe more depending on where you go from the mine. 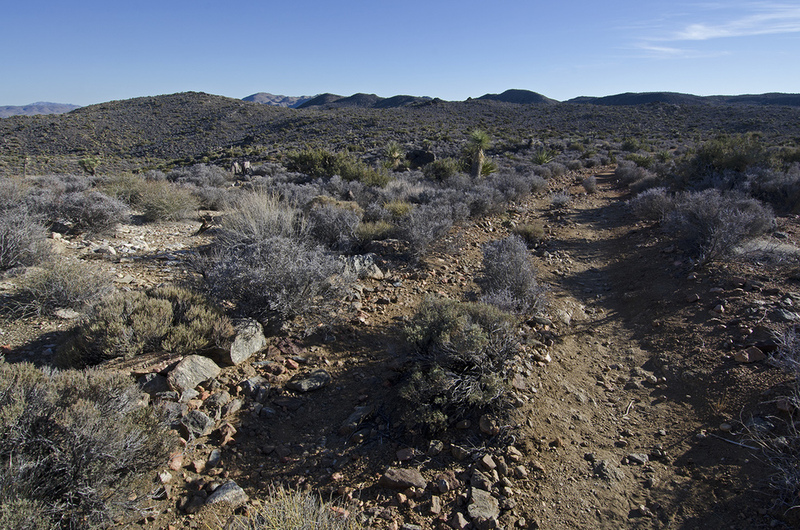 The trail is rated moderately strenuous and there isn't any shade to speak of along the way. Luckily, we chose a great day and the weather was perfect. 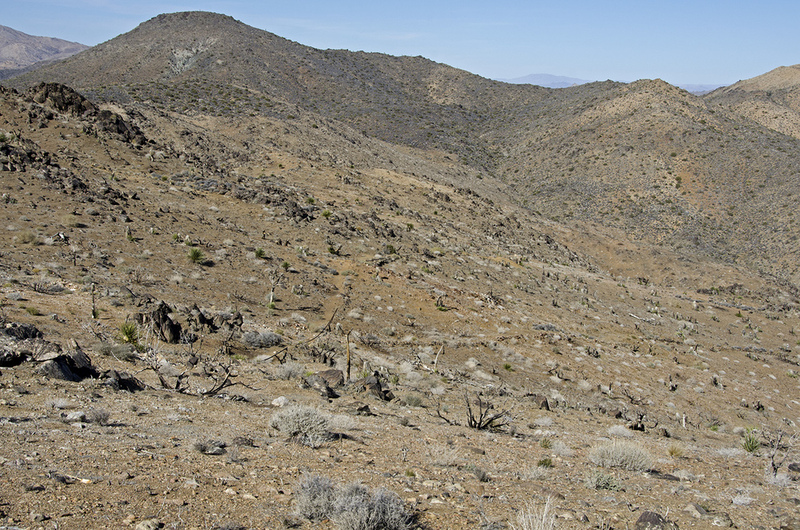 The hike started off uphill right away, but nothing two seasoned desert hikers couldn't overcome. It's actually a very nice hike. Following the old wagon road. Notice the vegetation in the foreground, it will change dramatically just up ahead. 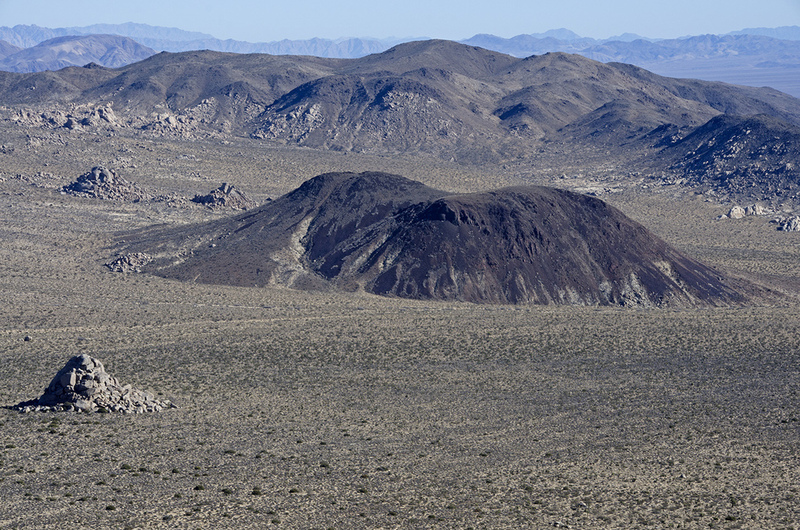 Back on May 24th of 2009, a wildfire ignited from unknown causes in a remote area of rugged hills between the Geology Tour and Keys View roads. 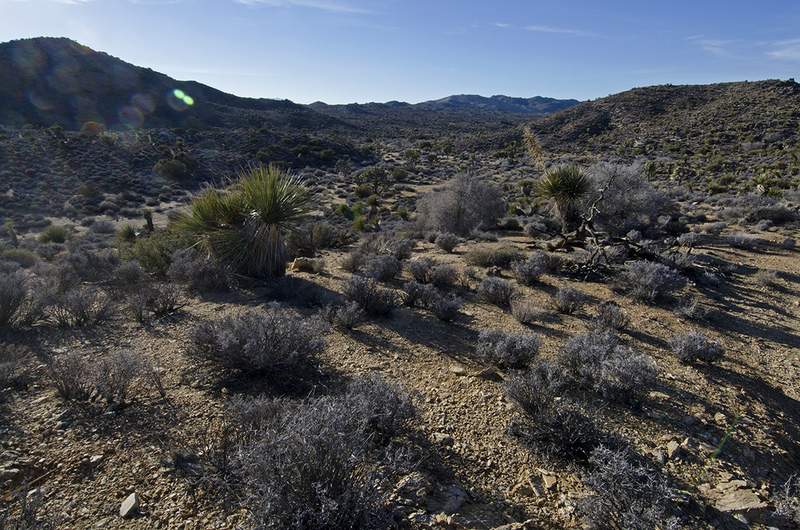 It began shortly before 4 p.m. and was fueled by desert scrub, junipers, pinyon pines and Joshua trees. Gusty winds didn't help matters. When the Lost Horse Fire was finally contained several days later, it had scorched some 450 acres of land. Luckily, the flames didn't reach the Lost Horse Mine. From this vantage point along the trail, you can look back down the valley you've just climbed and see the results of the fire on the left side of the canyon. It's pretty eerie walking through this area. 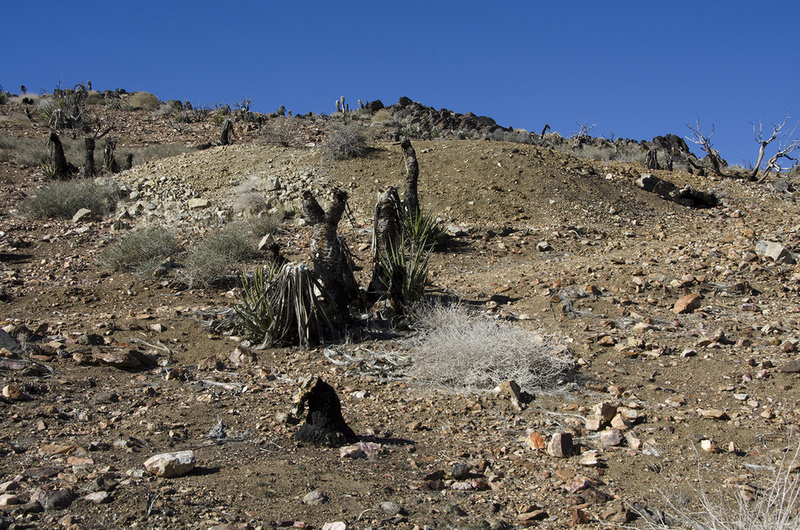 While the plants are beginning to recover some five years after the fire, it will still take many more years for the vegetation to reclaim what was lost. From space. It's plain to see where the fire burned and where it didn't. Continuing our trek uphill, it seemed like we had out-paced the circling vultures, so we eased somewhat off our pace. 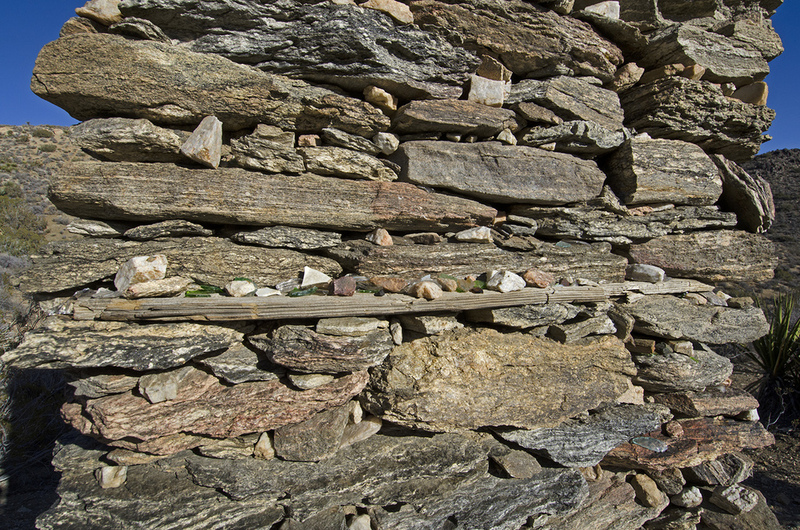 There are a lot of interesting rocks and plants along the route that cry out to be photographed, such attention-starved little things. Bighorn? This was up the canyon. Shortly after entering the burned-out portion of hills the road crossed through, I happened to spot an old stone cabin ruin south of the road and up a little wash. This was the highlight of the hike for me, at least up to this point. 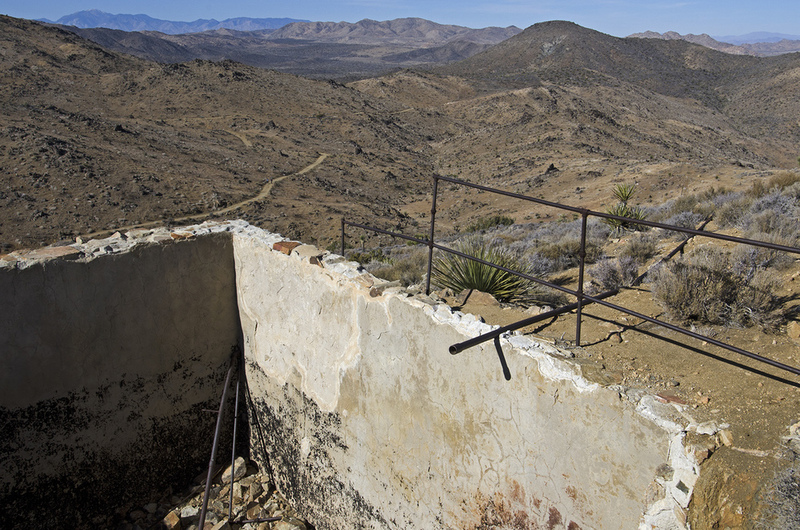 Of my favorite things to find out in the J Tree backcountry, stone building ruins are tied for the #1 spot, along with gold mines/machinery and abandoned vehicles. These things somehow resonate with something inside me and I get really excited when I find one I haven't seen before. Part of it must have something to do with the historian in me, who wants to know who built it/abandoned it way out here. Why was this spot chosen, who lived here and for how long. And then my imagination kicks in, wondering what it must have been like to live way out here. Did the roof leak during thunderstorms? How cold did it get? Who stopped by to visit. Was gunplay ever involved. 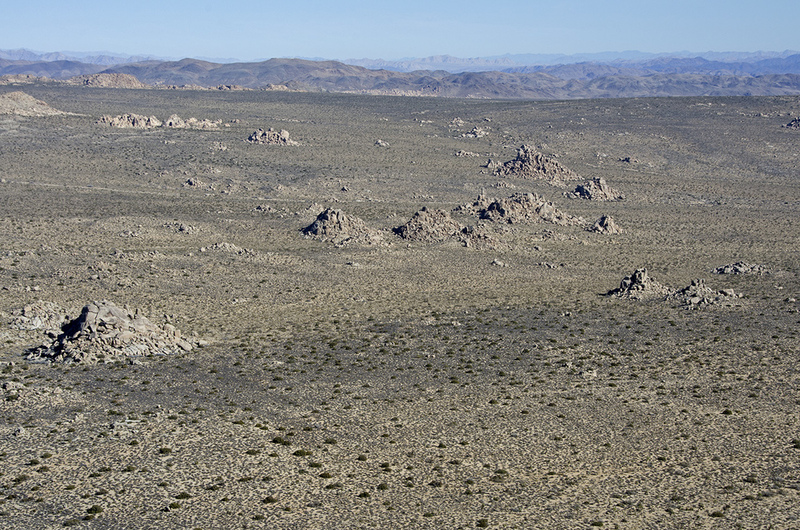 Did Yucca Man ever terrorize whoever lived inside. I will probably never know. 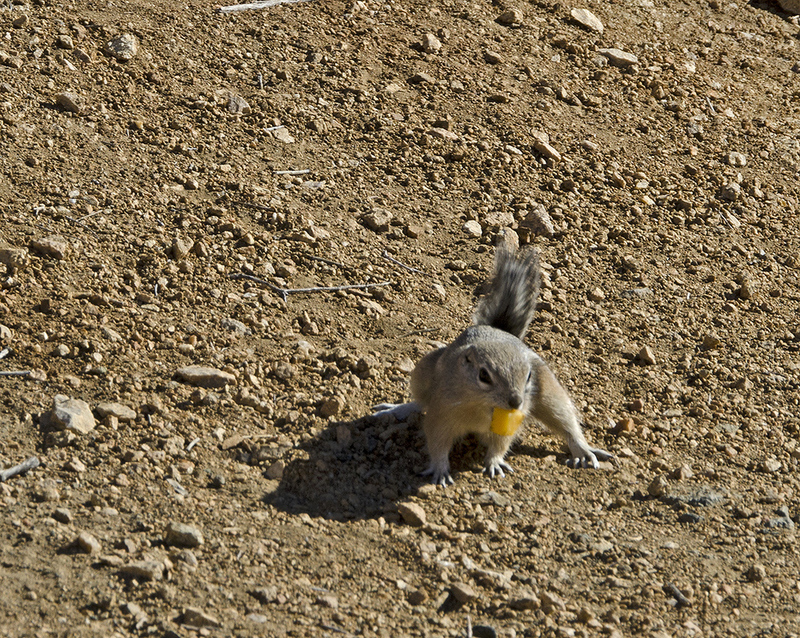 But I did wander about the area for quite a while taking pictures and exploring, while Murbachi waited, patiently. He's gotten used to my behavior upon finding cool places like this. After I'd poked around for quite a while, we finally got back on the road and it wasn't long before our main goal came into sight. We were getting closer, and it wasn't long before we were passing mine workings near the road. See the tailing pile to the left side of the road? This photo shows just how close the fire came to the stamp mill in the distance. 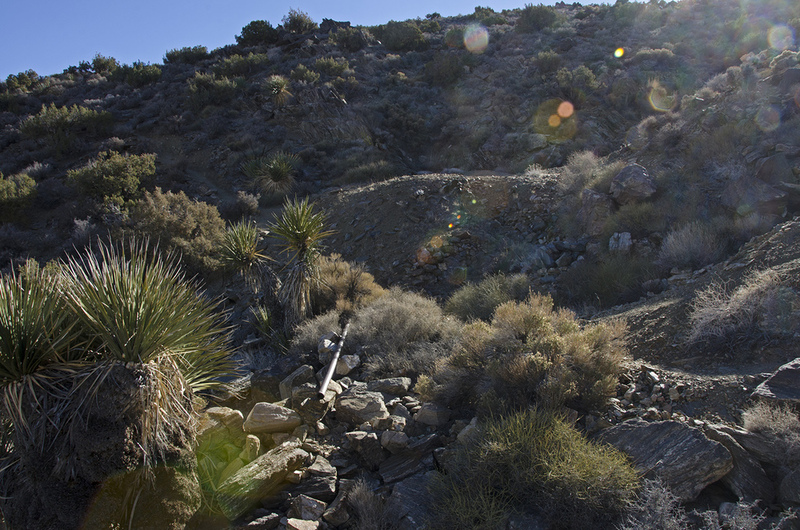 Here's a good view of part of the pipeline that brought water from Lost Horse Wells (3-1/2 miles distant) to the mine. 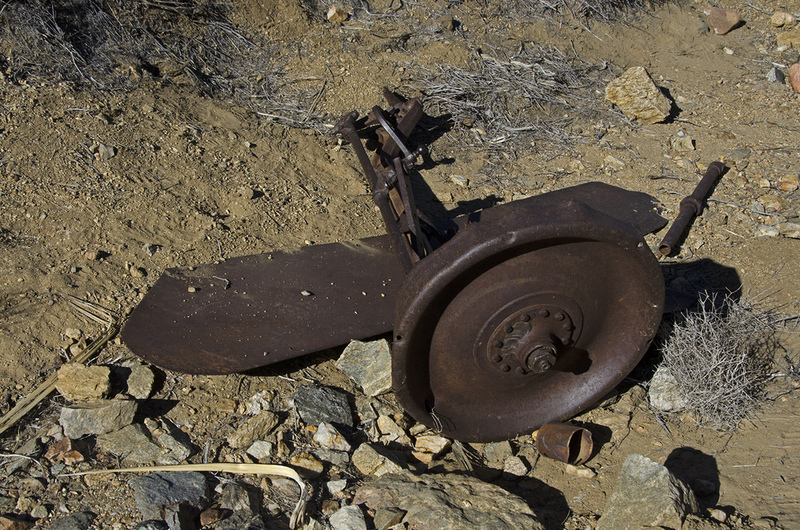 Whenever I hike to these remote spots, along these old wagon roads, I'm continually amazed at how the prospectors found the gold and at all the work that went into bringing in the equipment needed to get the gold out of the rock. Think of building the road, and putting in that pipeline from Lost Horse Wells. I'd like to find some information on how long such projects took. 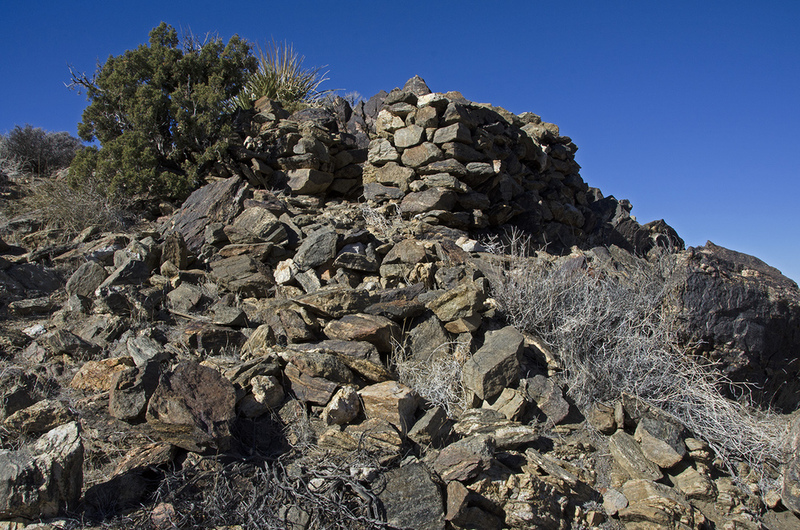 As we neared the main mining area, we began to see bits and pieces of old machinery, cement foundations that must have had some heavy equipment attached to it at one time, numerous tailing piles and shafts, and several stone building ruins. From the vantage point up at E's stone cabin, there's a great view of the main mine complex across the valley. 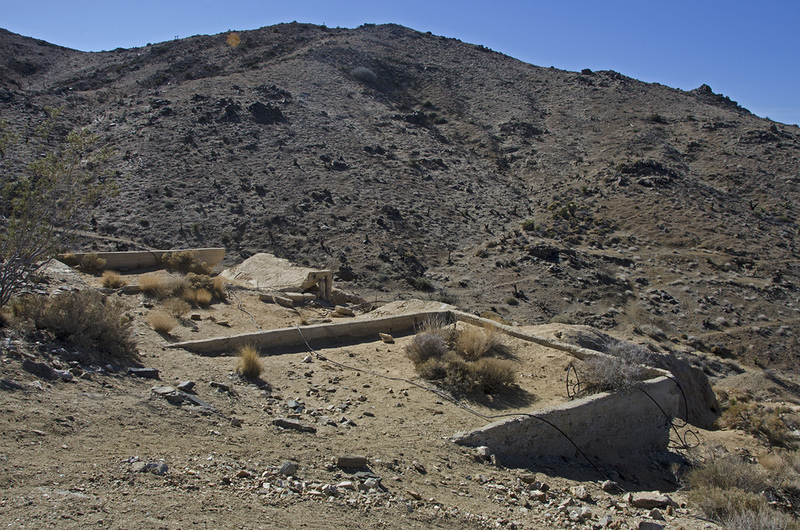 The stamp mill, foundations, cyanide tanks, water tanks and a few shafts and prospect pits. Look at all that cool mining stuff! Part of the old pipeline heading down to Lost Horse Wells. After traipsing around the south side of the valley, now it was time to head on over to the north side and check out the mill up close and personal. We didn't head directly there first, however. We skirted below those cement foundations on a road that led up the hill towards the west. I wanted to checkout the pipeline that once brought water up here so the mine could operate. You can see it in the foreground in the picture to the right. And there's the pipeline heading off into the distance. It brought water some 3-1/2 miles from Lost Horse Spring. 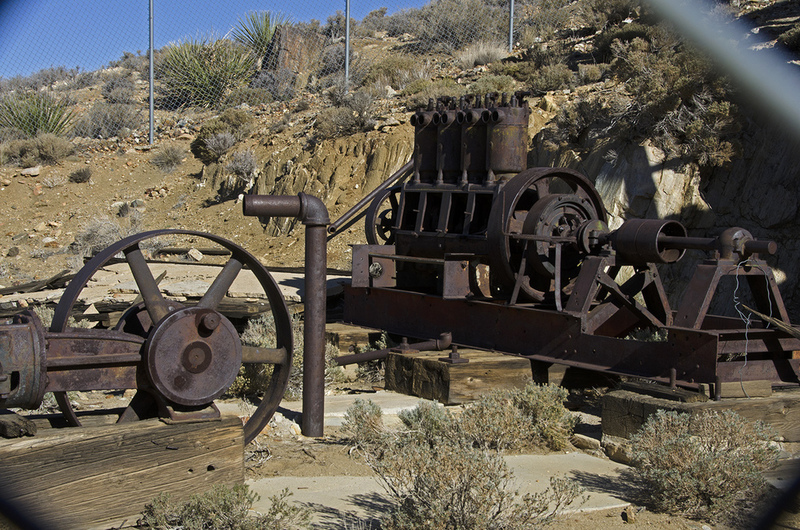 A steam pump provided the power to raise the water 750 feet over its journey to the mine. It kinda looks like a road branches off and heads downslope towards Pleasant Valley. I might have to check that out on the next trip. After taking a few pictures from this vantage point, Murbachi and I turned around and headed towards the gold. 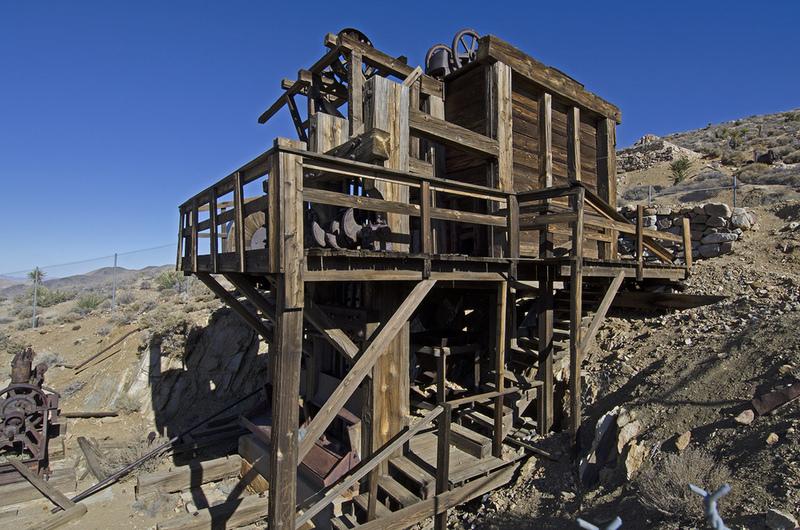 The ten-stamp mill that crushed tons of ore at the Lost Horse Mine was erected sometime during the late 1890s, probably in 1897. One report has it coming from the Sterling Mine in the Chuckawalla Mining District. It took four six-horse wagons and three eight-mule teams to pull it through Wilson Canyon and up to the mine. Situated on a steep slope, the mill was built directly over the shaft supplying the raw ore. Originally run by steam power created from the water piped in from Lost Horse Wells, the system was later converted to a diesel engine. The mill itself consists of huge wooden timbers that support an ore bin, an ore crusher, several ore chutes and two five-stamp batteries. The headframe and ore tipple that used to stand behind the mill collapsed sometime around 1970. Bill Keys recalled that at one time the entire mill and headframe were enclosed by a frame structure, known as the "Big House." I remember being here when I was a boy, before the structure was fenced in. And while I understand the necessity for it being fenced, I'm sorry that it has to be so. I'd really like to get a closer look at the workings. The wooden steps and safety rail were added to the structure in 1973, I'm not sure when the fence was erected. The mill is included within the Lost Horse Mine National Register boundary. What made this mill so unique was being built directly over the shaft being mined. This cut down on a lot of expense, as the ore didn't need to be transported to a milling site. Mining journals provide only sketchy details on the Lost Horse Mine's operations over the years and with several different stories about how the mine was located, where the ore was first crushed, who the exact owners were and when they owned their slice of the mine, the history here would make a great mini-series on HBO. 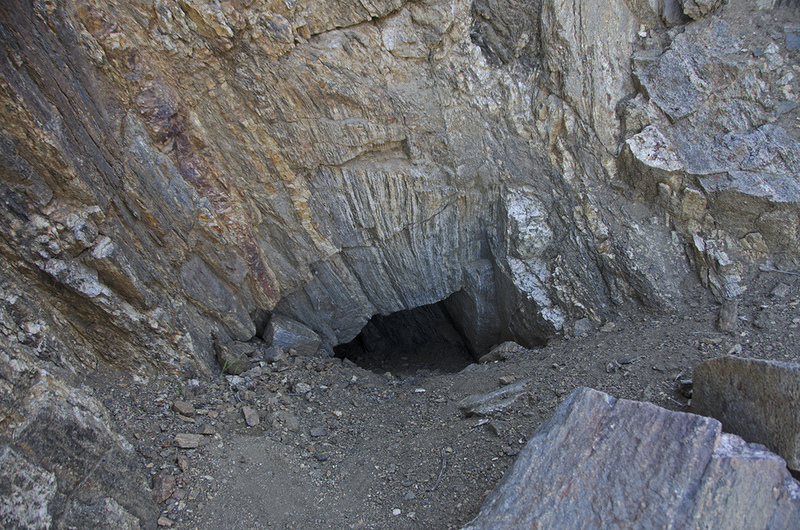 A few of the semi-concrete facts are that the Lost Horse Mine's operation probably began in 1894. During that first year, ore was hauled eight miles to the Pinon Mountain mill. By 1895, a two-stamp mill had been erected near Lost Horse Springs and the ore was being processed there. The Lost Horse Mining and Milling Company was incorporated in 1897, with a capital of $500,000. 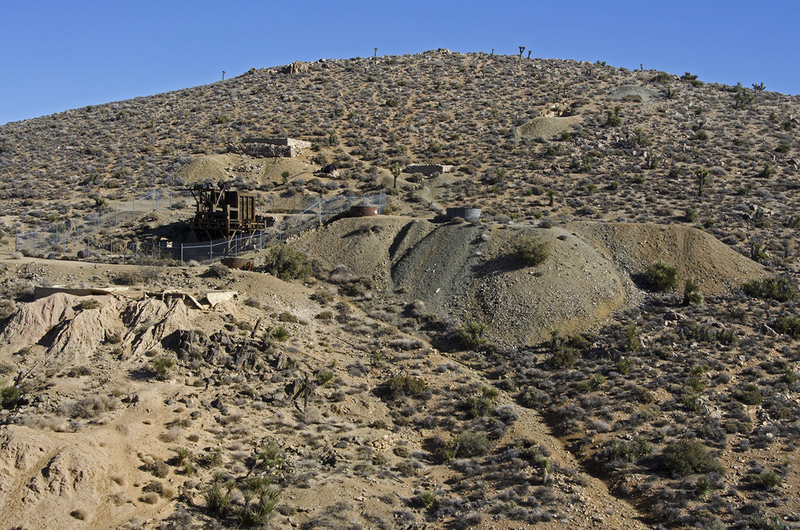 The majority of the gold that was mined at the Lost Horse was found from 1896 to 1899, some nine thousand ounces. It was during this time that the ten-stamp mill was erected over the main shaft of the mine. The Ryan family eventually gained full ownership of the mine and over the years they leased it out to a number of different parties, all hoping to strike it rich. No one ever did. J.D. Ryan was apparently the last person to work the mine when he cyanided some six hundred tons of tailings in 1936. 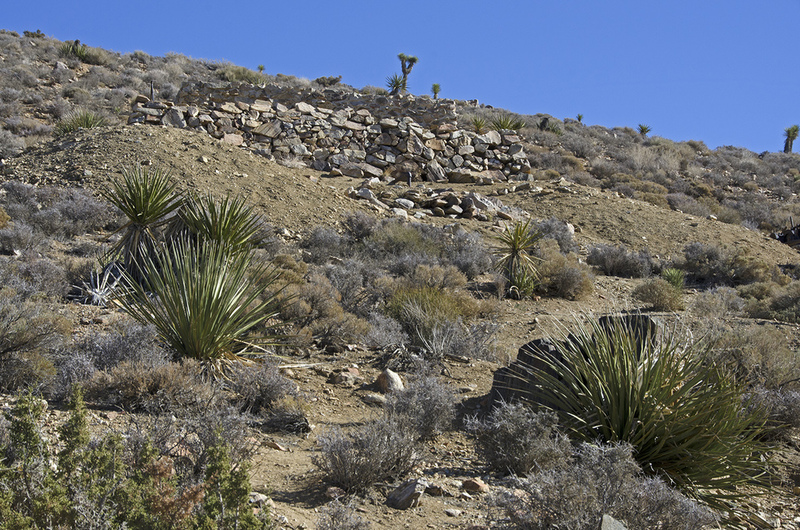 The National Park Service acquired title to the Lost Horse Mine from the Ryan family descendants in 1966. Since that time, the mine road has been closed to vehicles, a concrete slab has sealed the main mine shaft and the historic mill has been somewhat restored and stabilized so we explorers can visit it today. If my wayback machine was still working, I'd love to go back to when the Lost Horse Mine was in its heyday. Imagine the surrounding hills with wagons rolling along the road, miners all over the place, a stone bunkhouse, woodframe assay office, stone cookhouse, corral and numerous stone cabins dotting the hills. But sometimes, I can still see them. After inspecting the mill and immediate vicinity, we climbed to the top of the hill upon which the mill sits. There are several other small prospect holes that were interesting to investigate, but the real reason to climb to the top is the amazing view that rewarded our exertions. Unobstructed view of Pleasant Valley. The Towers of Uncertainty, the Lost Pencil, Malapai Hill, the Hexie Mountains, Fried Liver Wash and a lot more places I don't remember the names of right now. It was an amazing view. After hiking about a half mile, we rounded a corner and came upon an old mine which had a tunnel on one side of a little outcropping and what appeared to be an inclined shaft on the other. I'm fairly certain this was the Lang Mine. Possibly something Lang discovered while working at the Lost Horse Mine. I had been hoping that the stone chimney would be somewhere around here, as we had talked with a young German hiker (who didn't seem tired at all), and he had said that it was close by when we passed him. But after scouring the area, we determined it must be farther along the trail. We continued along, gaining some slight elevation as we were kind of skirting a shoulder of Lost Horse Mountain. We had been wondering when the trail would start heading back towards where we knew we needed to eventually end up. And after another half a mile, there it was. 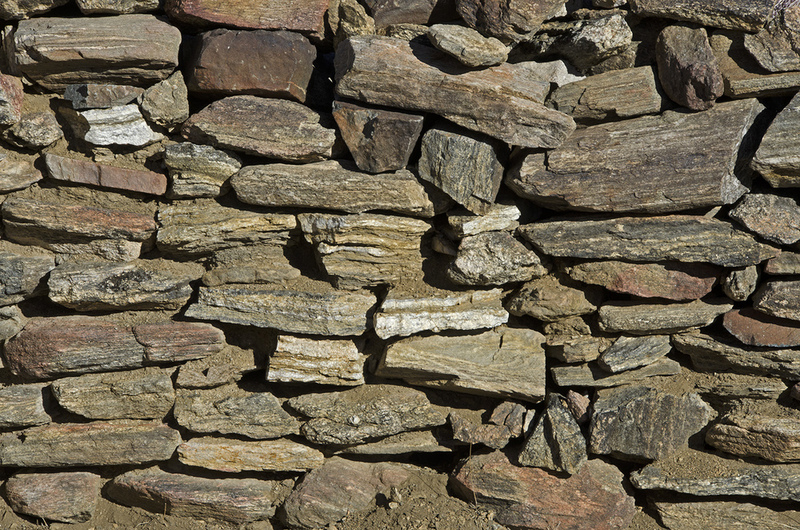 Can you see the stone chimney? There is NO protection around this 100+ foot deep shaft, stay well back from its edges. 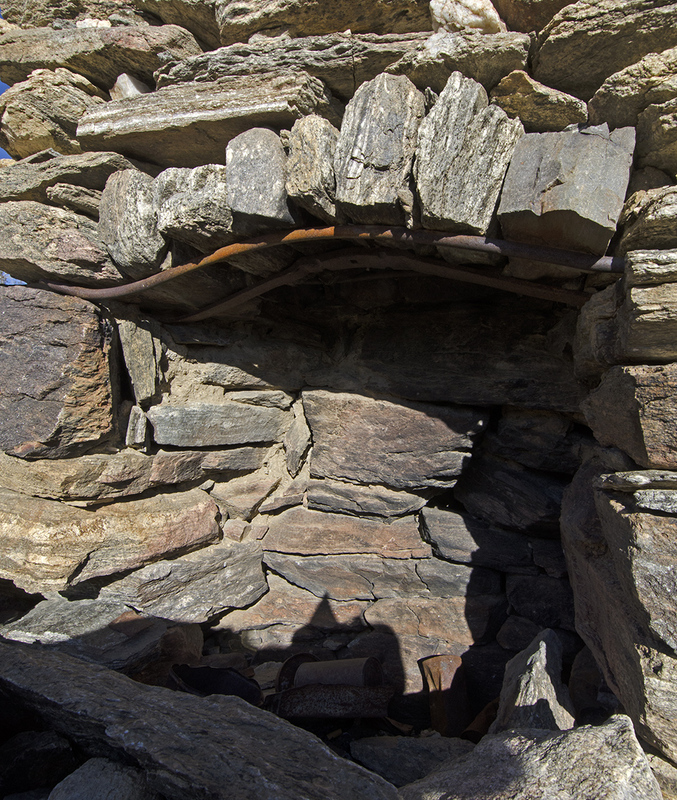 My thoughts on the stone chimney are that it was once part of a cabin that housed whoever it was that worked on the Optomist Mine, which is located right nearby. I wasn't able to find much information about the Optomist Mine, but I guess it was discovered by someone who was always looking at the bright side of things. There is a 100+ feet deep vertical shaft which is NOT fenced or blocked. The faint cries I heard coming from its depths were profoundly pitiful. There are also a number of shallow pits, trenches and tunnels in the area, which makes it a fun place to explore. But the main attraction for me was the stone fireplace. It's way cool. I'm pretty amazed that this is still standing. I wonder how big the cabin was that it was attached to, I couldn't see any foundations. 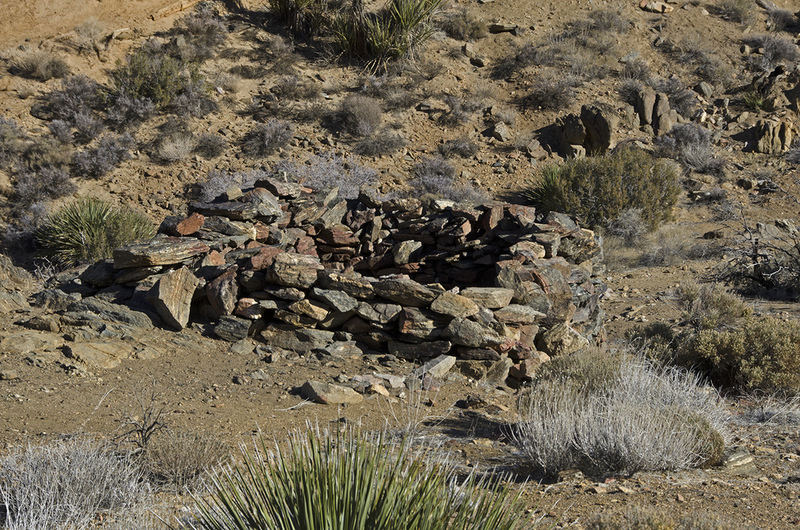 We had found the stone chimney and now it was time to resume the hike back to my truck. The trail follows the contours of the hills and eventually turned in the direction that we needed to go. It was all mostly downhill and a fairly easy hike, following an old wagon road. For some reason, it seemed like it was a long way. 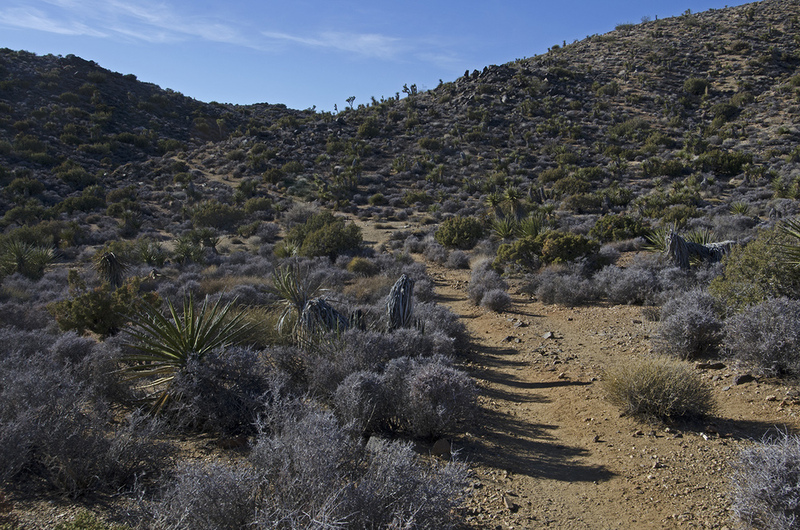 We finally reached a spot where the hills met the desert floor and from there the trail follows along a good sized wash. The occasional trail sign confirmed our belief we were on the right path. 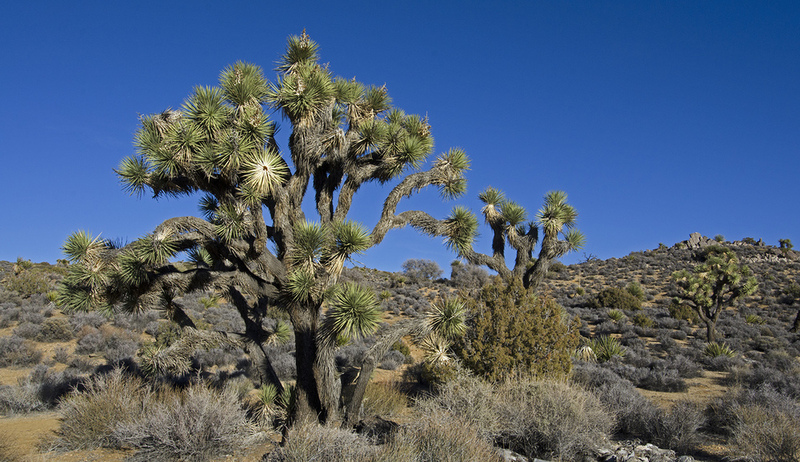 This last stretch of trial has a lot of very large and very photogenic Yucca brevifolia (OK, that's just the fancy name for Joshua Tree). And the trail continued. It was somewhere along here that I saw a sign regarding the "Big Trees" trail. 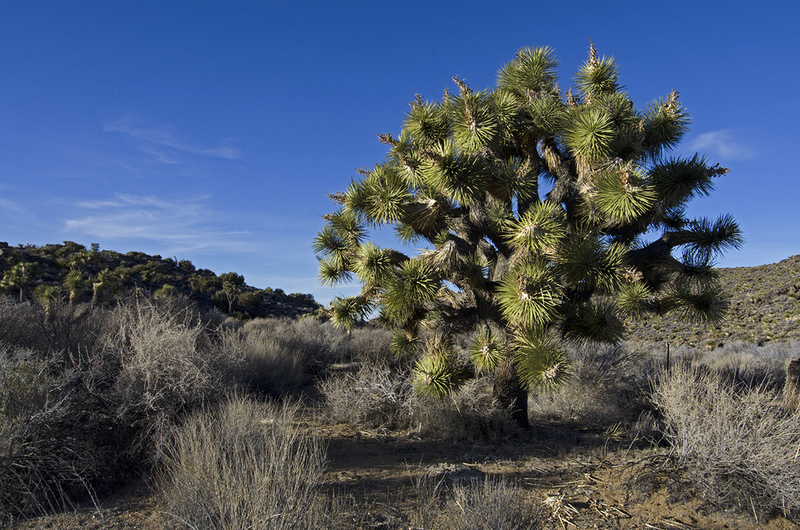 I had never heard of that one before but imagine it goes by some really big Joshua Trees. I'll need to do some research on that one. And it was just tonight while finishing this post that I figured out why it seemed like such a long hike out from the stone chimney. I measured it on Google Earth. From the chimney back to the trail head is about 3-1/4 miles. Not really a long distance, but longer than I thought it was at the time. 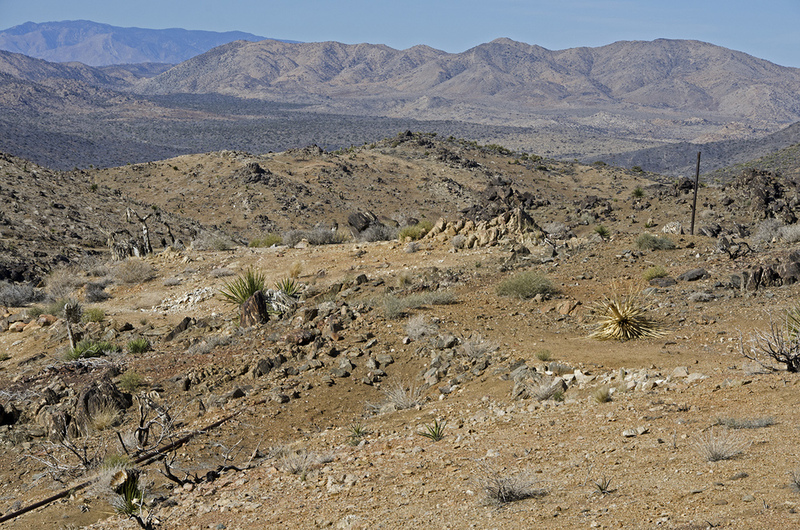 The scenery is the star on the last part of the Lost Horse Mine Loop Trail. 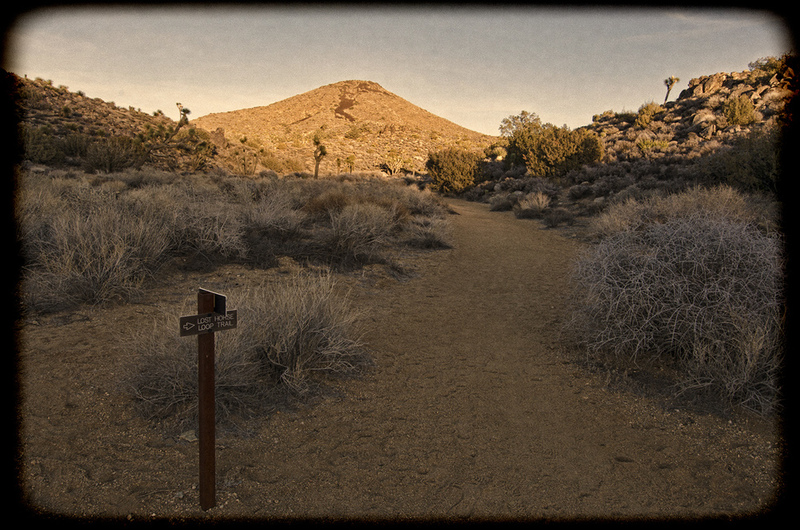 Make sure to visit Murbachi's website, JoshuaTree3d.com for some great pictures of this hike, and many others as well. Awesome pics, both in 2d and in 3d, click HERE to go there automagically.